Are you new to exercise? Or maybe you already exercise, but you’re looking for something different? You’ve come to the right place! We specialise in caring for YOU, no matter who you are. Range of Motion offers a free ‘Test Drive’ valued at $180 to see if we’re the right fit for you. Watching this video is a great way to learn more. Contact us to arrange a time to catch up and discuss how we can help. Starting with Range of Motion is super simple. We’ll get back to you to organise a time to catch up that’s convenient for you, so we can get to know you. You’ll sit down for a chat with Dan. We’ll discuss how Range of Motion can help you and if we’re the right fit. 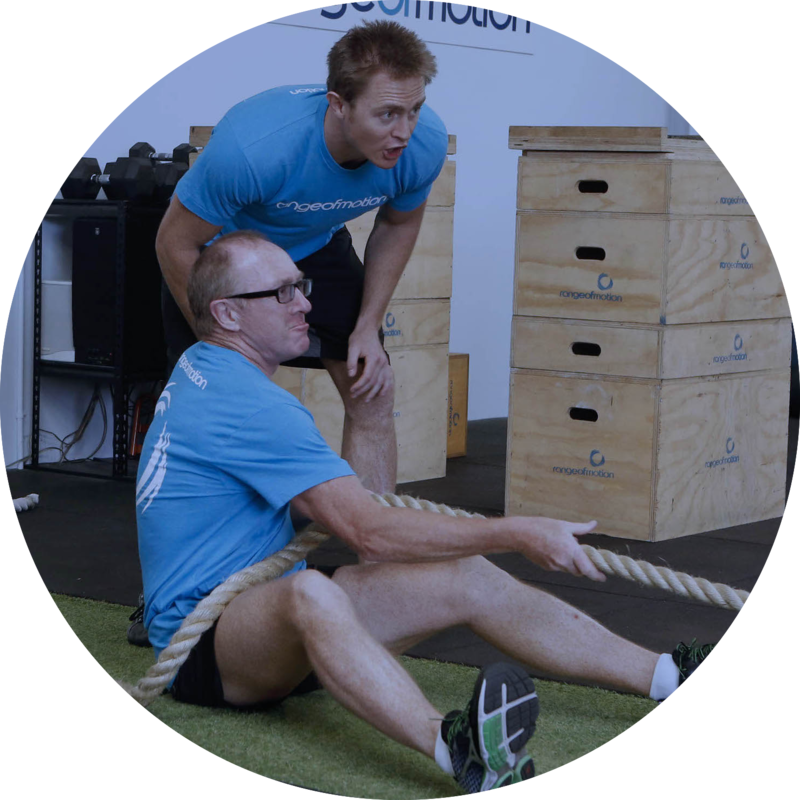 We’ll arrange a complimentary 60 minute one-on-one session for you, so you can get a taste of how we roll. Over your first few sessions, your coach will teach you all the basics, the foundation for your journey with us. STEP 6: You're a 'ROMMER'! Welcome! You’re now a ROMMER! Scroll down to learn more about how Range of Motion works. How does Range of Motion work? Are you the sort of person who believes your health and fitness deserves a tailored and specialised approach? We realise that delivering you to where you want to go requires an individualised level of care. Our clients receive this care and quality approach through one-on-one sessions with their own personal coach at least once a week. We understand that everyone has different obstacles to overcome and goals to achieve, so your exercise program is unique to you. 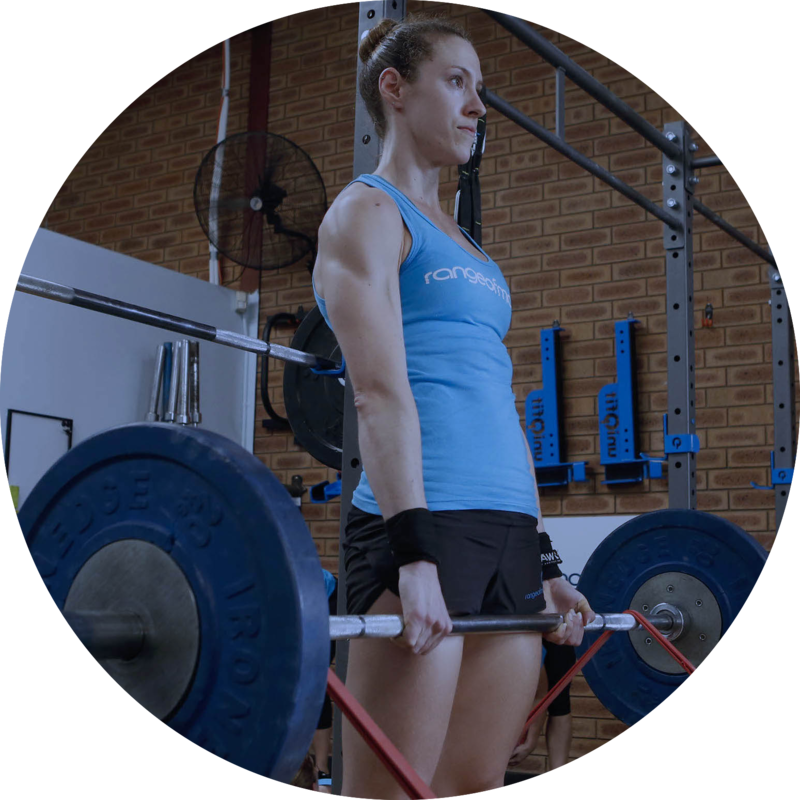 It’s constructed for you by an Exercise Physiologist and managed by your coach. You’ll follow your program during your one-on-one sessions, and also if you choose to train at Range of Motion outside these sessions, when you’ll have full access to our facility. Though individualisation is important, we know that some benefits come only from building relationships and exercising with friends, so we offer plenty of opportunities to do just that – and it’s a lot of fun! You’ll be surrounded by a happy and healthy community of people who share your values. 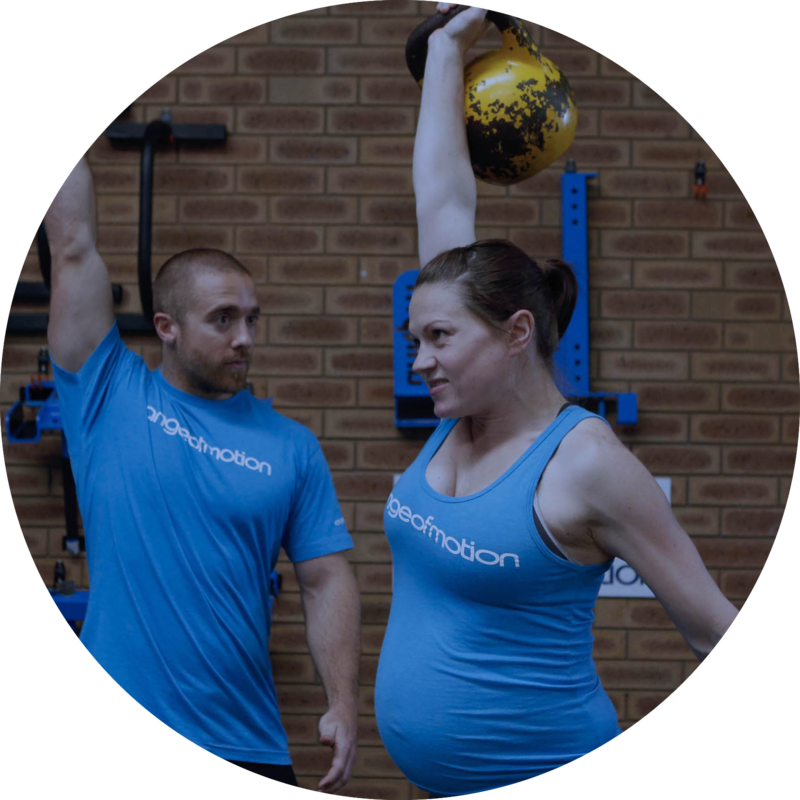 What is Range of Motion's pricing policy? 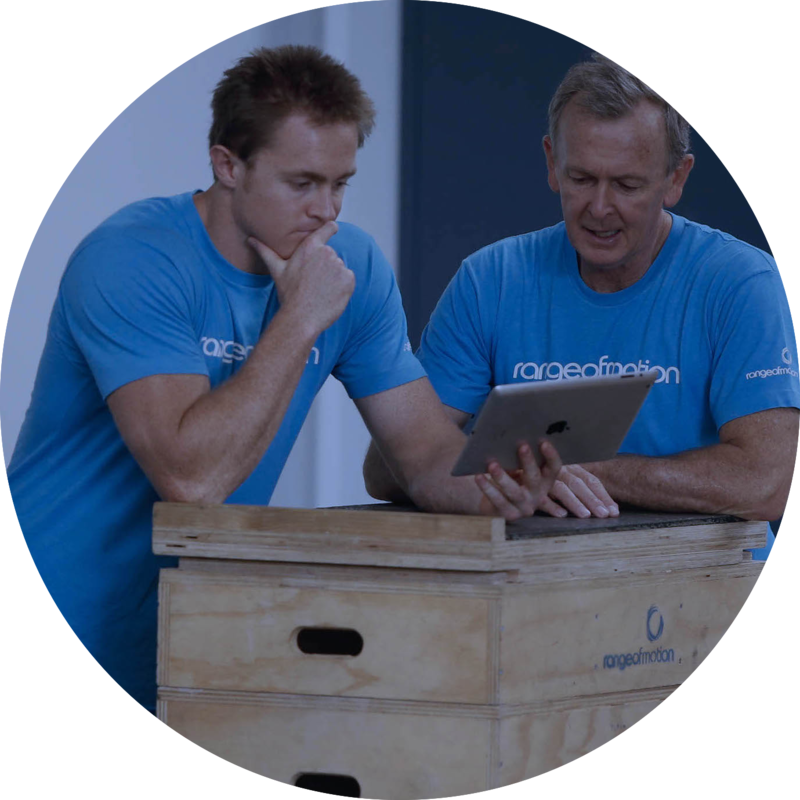 An individualised approach needs an individualised pricing plan, so while we won’t know exactly what this entails until we’ve had a chat with you, as a rough guide, one-on-one sessions with your coach range from $45-$60, and for $25 per week you’ll get full access to Range of Motion during all opening hours, including a whole heap of other benefits. 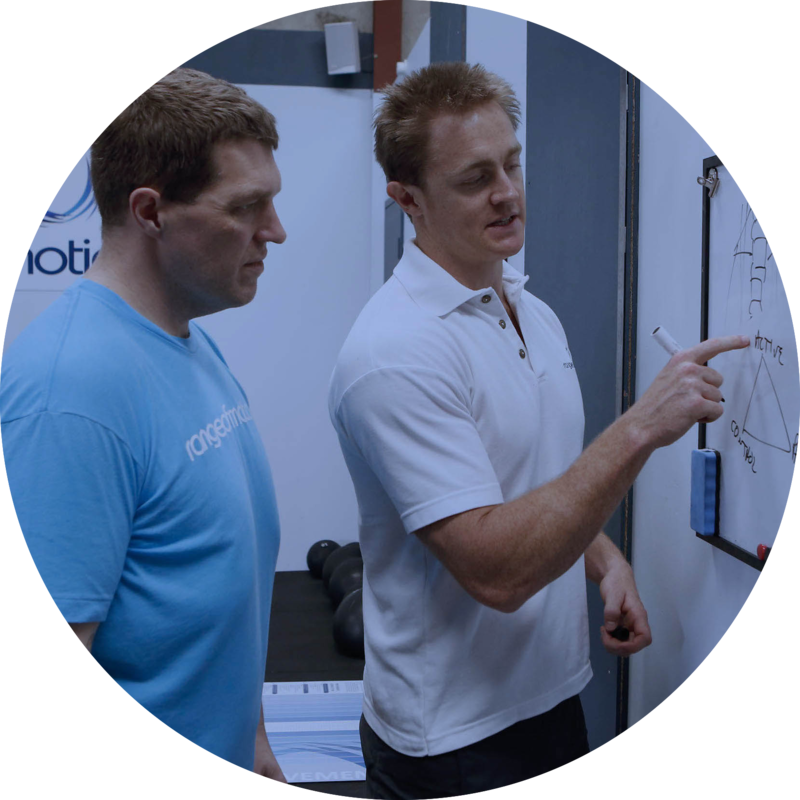 The cost of your session extends far beyond the session itself – it entitles you to our full level of care, and includes subscription to our individualised programming software, free workshops, discounted rates on events, goal setting sessions, injury consultations and 24/7 support from Dan Williams outside one-on-one sessions. Is Range of Motion right for me? The beauty of what we do lies in its scaleability, so the short answer? Yes! Pure beginners, everyday exercisers, the morbidly obese, the chronically diseased and elite athletes all fit neatly into Range of Motion’s Model of Health. Our one-on-one model ensures this highly individualised scaleability. I'm nervous about starting. Am I fit enough? This is completely normal. We have people come through our door every day who are venturing out of their comfort zones. We provide a caring, safe, inclusive and supportive environment (in fact, this is one of our six core values). We understand that starting something new can be a bit scary. Everything we do is scaleable for all abilities, as you’ll see during your complimentary consultation. We’ll guide you through the process at your own speed. We follow a progressive pathway through your exercise experience. We start with technique, making sure you can complete exercises safely and effectively. Then we build in consistency, where you can replicate this great technique. Only then do we add intensity, a very important variable to improve measures of health and fitness. Hat off to you for taking this first step! 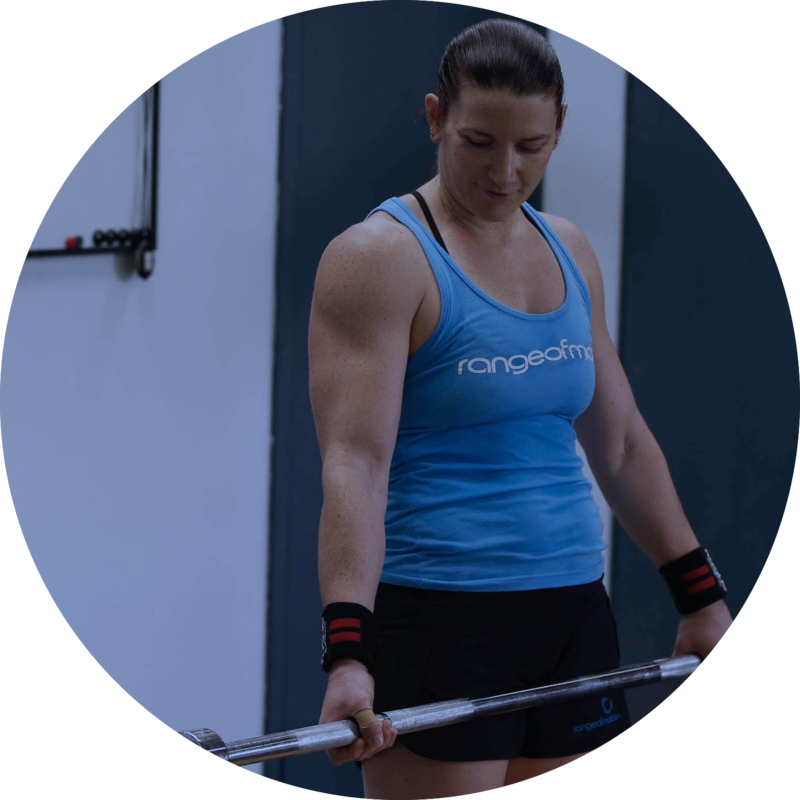 Do you do classes at Range of Motion? Classes are a great way to ‘spend time in the trenches’ with your fellow exercisers. While they can be a lot of fun, they don’t form the basis of how we help people. We don’t for a second think that our approach is better, it’s just different, and that might mean it’s better for some people. We specialise in helping people who need a bit more one-on-one care. Of course, exercising with your friends is fun, so we offer heaps of opportunities for you to exercises side-by-side with your fellow ‘ROMMERs’. If you’re looking for more of a class-based approach, we know some great local places – reach out to us and we’ll point you in the right direction. We have our own brand of exercise which we prescribe through individualised programming and one-on-one sessions – not a focus on classes. In our exercise programming, we draw on our background in Exercise Science to provide a carefully tailored approach. This means we take the best bits of various training approaches to suit the individual. This includes approaches used by CrossFit, athletics, gymnastics, weightlifting, powerlifting, strongman, swimming and much much more. 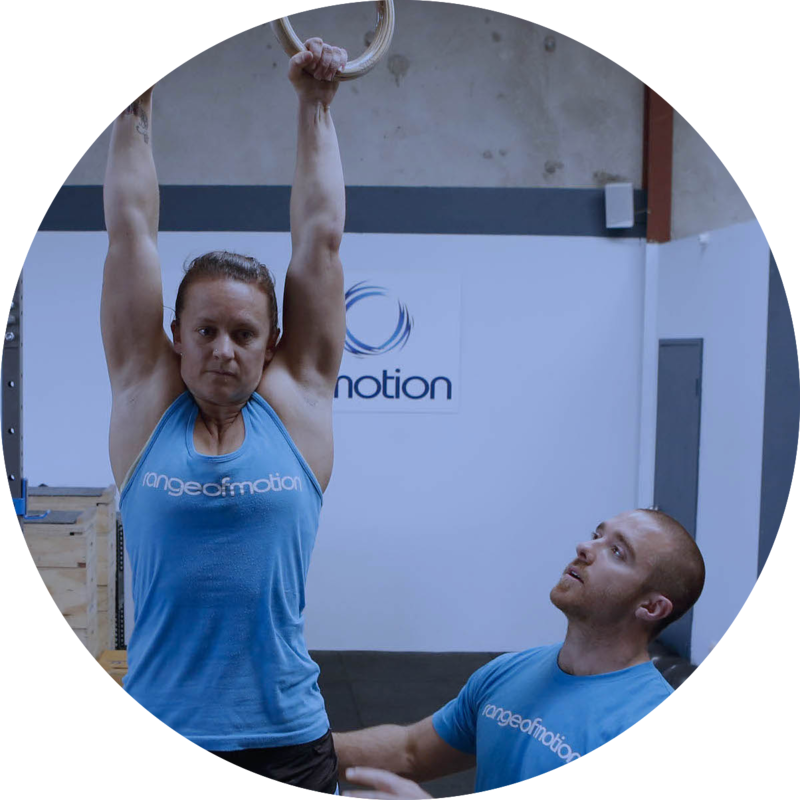 We do have a CrossFit Affiliation (Range of Motion CrossFit), but the way we use this is different to what you’d see in a ‘CrossFit Box’. What style of exercise can I expect? You can expect to complete many different forms of exercise, including elements of gymnastics, sport, Olympic Lifting, power lifting, strongman, swimming and athletics. We explore an introduction to these in your complimentary session. 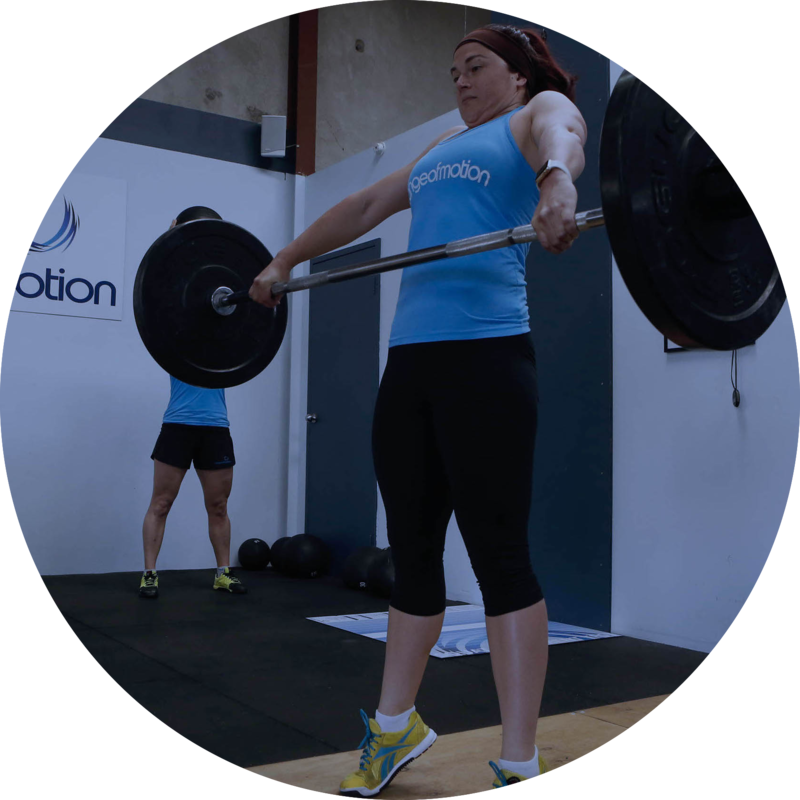 We do movements that your body has evolved to complete – it’s what your body needs! 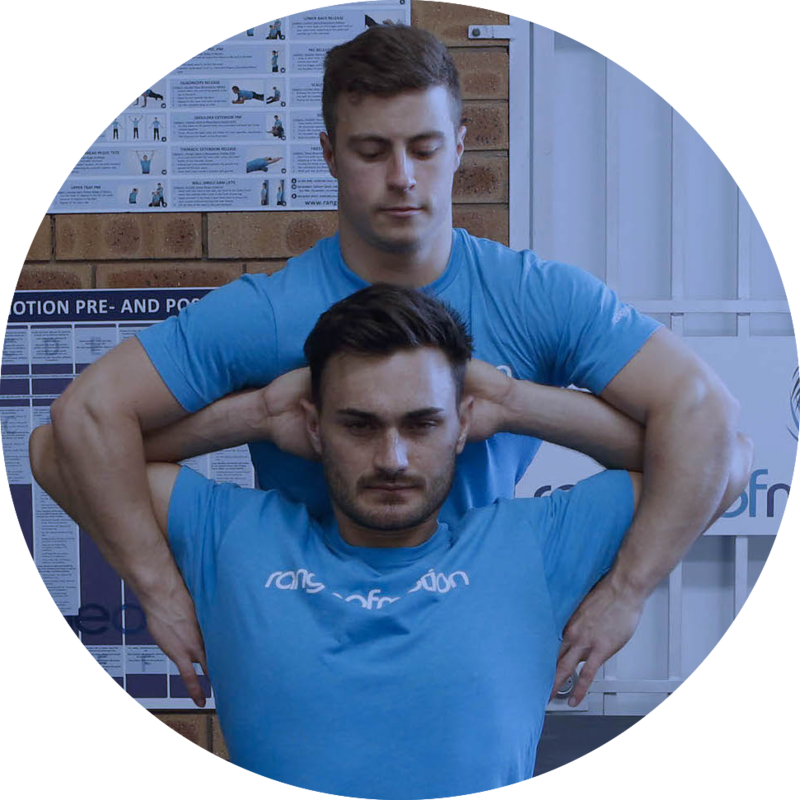 We use these elements in ways that are appropriate to your abilities – everything we do at Range of Motion is individualised just for you. And the variety means it’s a lot of fun! What effect will this style of exercise have on my body? It will make you look ‘athletic’. Unlike many traditional exercise programs, we don’t focus on appearance, we focus on performance – but a funny thing happens. While you’re working on getting better, you’ll experience drastic changes in body composition. We see increased lean muscle mass and reductions in body fat as a happy side effect of your increased performance. Tell me about the exercise program I'll follow. Because every client of Range of Motion follows a different training program, we created a piece of software to profile and provide exercise for your unique needs. Our programming is varied, all inclusive, 100% unique and individualised, and biased towards the things that most need focusing on to target your needs. We tailor for all levels, from recreational exercisers to top level competitors. We provide you a clear training direction to. We focusing on achieving outcomes, we track your progress, delivering you maximum results. What's involved with my one-on-one sessions? You’ll get to Range of Motion at least 15 minutes before your session is due to start. You’ll know what session you’re doing in advance because you’ll have full access to your program on your phone. Your coach will have taught you how to do the pre- exercise routine for that day’s session, which you’ll do before your session begins. At the start of the session your coach will touch base on how you’re feeling. We don’t underestimate the power of empathy, and we realise that we may need to make changes to the day’s plans if life demands it. 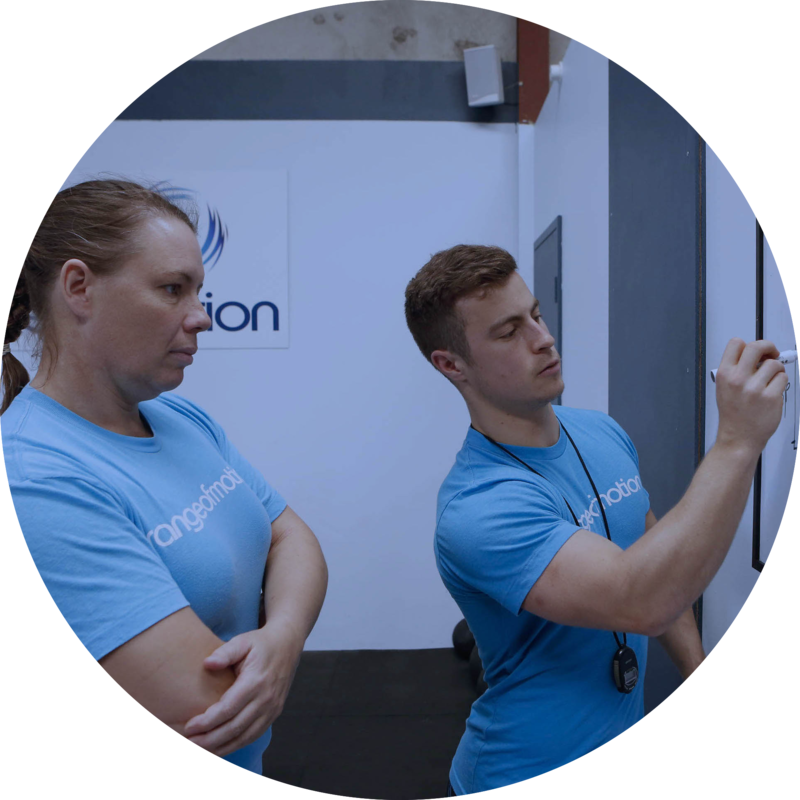 Your coach will write your session on the whiteboard, and you’ll discuss the main things you’re going to focus on, and talk strategy. During the session itself, your coach will be there to teach, guide and motivate you. As you progress through that day’s session, they’ll also conduct a movement assessment that will allow them to give you some specific extra work to do after you’ve finished. At the end of the session, you’ll debrief with them, looking at things that can be improved next time, and reiterating any lessons you can take away. Following your session, you’ll complete your post- exercise routine on your own based on the training you did and any faults your coach noticed. Your coach will teach you how this process works, and the importance of doing it to keep your body healthy. It’s our job to ensure you leave feeling better than when you arrived. What do I do when I come in on my own? Once your coach is confident they’ve taught you the ropes, they’ll recommend you start doing some extra work on your own at Range of Motion. But you’re never really alone at ROM. At any one time there will be multiple coaches around to help you out, and you’ll be surrounded by ‘ROMMERs’. One of our core values is to be accountable and responsible for building habits of excellence in ourselves and others. Everyone’s there to help, and in time, we hope you’ll do the same. You’ll follow a pre- and post- exercise routine before and after your training, and can do a session that you and your coach have decided is safe and appropriate for you to do on your own. What Can Range of Motion Do For Me? Picture yourself in three months. One year. Five years. Ten years. Really think about it. Where is your current path leading you? Now picture where you WANT to be. This is what Range of Motion can do for you. It’s our job to take you from where you are to where you’re going. Moving along that continuum of health, happiness, fitness and performance. And because the destination is different for everyone, the journey must be different too. And this is where we excel. We provide a tailored and individualised solution – unique to your needs. Whether you’re trying to build general health and fitness, improve your performance, treat an injury or condition, change your body, or simply feel better about yourself, we can help. We believe in the power of long term change. We believe that small, healthy habits, performed consistently can have a massive impact. 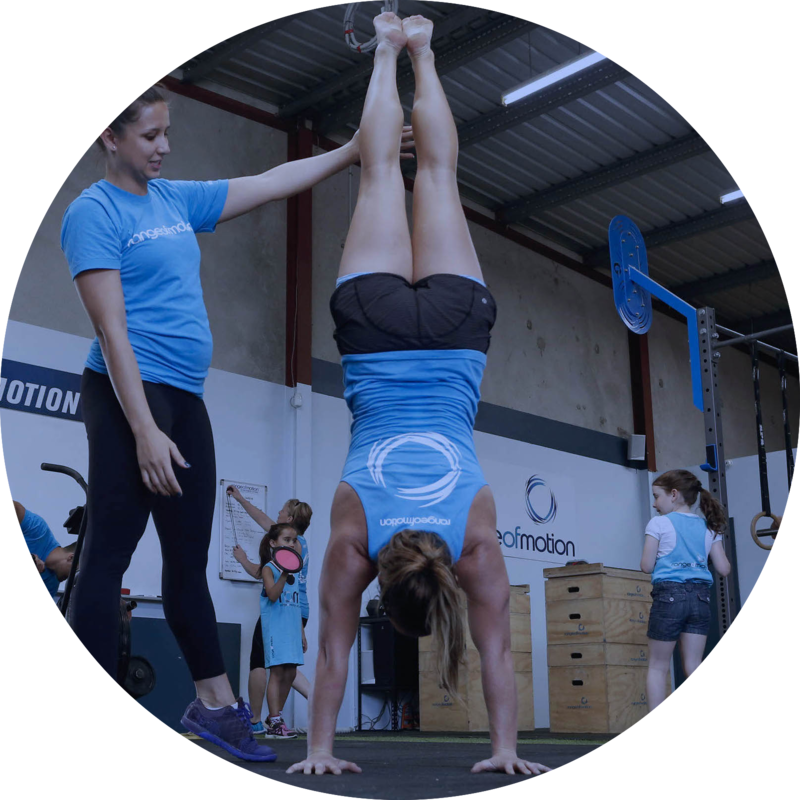 Our mission is to build happier, healthier, fitter and more highly performing people, communities and generations. and are a compass for everything we do. Pursue and celebrate growth and achievement. Evolve thinking and behaviour through the sharing of science based knowledge. Forge meaningful and significant relationships. Be accountable and responsible for building habits of excellence in ourselves and others. Provide a caring, safe, inclusive and supportive environment. Purposefully impact individuals, communities and generations through individualised care. Do our values match yours? Think we'd be a good fit? Contact us now. Where is Range of Motion?